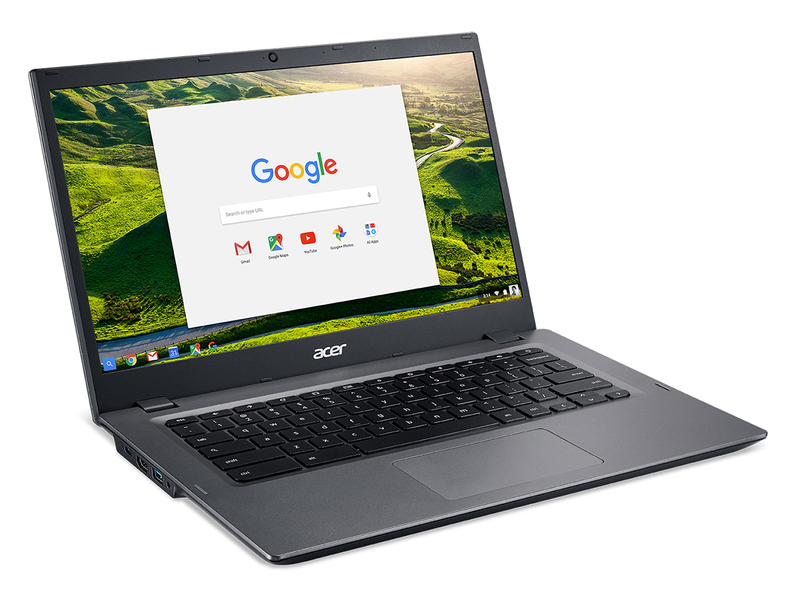 Acer debuts its new Chromebook 14 for Work, the industry’s first Chromebook with 6th Generation Intel® Core™ processors, with a durable design that meets the demanding needs of enterprise, government, small business and institutional users. Powered by a Skylake Intel Core processor to provide exceptional performance and long battery life (up to 10 hours), the Acer Chromebook 14 is also the world’s first notebook with incredibly tough Vibrant Corning® Gorilla® Glass to provide corporate customers with the flexibility to design the top cover with highly durable and scratch-resistant photo realistic images. The new Chromebook is compliant with Google’s Chrome for Work initiative, providing business-class security, manageability and durability to enterprise, government, institutional and small businesses customers. It is easy to deploy and manage over a wide range of employees and offices. The first Chromebook with 6th Gen Intel Core processors, it provides customers with a considerable performance improvement over previous generations and allows customers to multi-task with ease through multiple apps and documents to boost productivity. It also provides up to 12 hours of battery life (HD display models) and up to 10 hours of battery life (Full HD displays). Two keyboard options are available: standard and backlit models for improved efficiency in low-light areas. The Acer Chromebook 14 for Work has enhanced durability features. The spill-resistant keyboard provides protection against spills of up to 11 fluid ounces (330ml), with a unique gutter system under the keyboard and touchpad that drains liquid through two drain holes to route water away from internal components and out the bottom of the chassis. It has been tested to withstand up to 132 pounds (60kg) of downward force as well as drops of up to 48 inches (122cm). The large 14-inch display was designed to fit into a chassis typically used for 13-inch displays. The extremely narrow bezel gives customers an immersive experience when enjoying the display while reducing the overall size of the device. The Acer Chromebook 14 for Work weighs only 3.2 pounds (1.45kg) and just 13.03W x 8.94D x 0.88H inches (330.9 x 227 x 22.4 mm) thin. Administrators will find setting up and managing Acer Chromebooks to be intuitive and efficient. The Acer Chromebook 14 for Work has a Trusted Platform Module solution integrated to protect files, documents, and photos securely in the cloud with 100GB of free storage on Google Drive so the most current file version is always available even if the Chromebook is lost or stolen. Employees will stay connected and in touch using the device’s fast dual-band 802.11ac Wi-Fi featuring 2x2 MIMO technology. The Chromebook also connects to peripherals via Bluetooth 4.2. The Acer Chromebook 14 for Work will be available in several configurations, either with 32GB or 16GB eMMC storage and either 8GB, 4GB or 2GB of dual channel LPDDR3 SDRAM. To extend the capabilities of the Chromebook 14 for Work, customers can connect it with a single cable to the Acer USB-Type-C Dock to easily transform it into a powerful workstation and enable high-speed video, audio and data transfer and keeps the work area clutter-free with immediate connectivity to multiple displays and other devices simultaneously. It also has DisplayPort, HDMI, two USB 3.1 Type-C ports and three USB 3.1 Type-A ports, as well as audio input for microphone and audio output for speakers. The new Chromebook 14 for Work was recently unveiled at the next@acer press event at 4 World Trade Center in New York, where the company announced a range of new devices and solutions for high-performance and style-conscious users, families, students and professionals. To learn more about availability and product specifications, contact the nearest Acer office or retailer via www.acer.com.ph.